In this blog post we look at how a combination of MacroView software with Office 365/ SharePoint Online enables solutions that are an attractive replacement for Exchange Public Folders. For years, many organizations have relied on Exchange Public Folders as the way to manage the emails that were important to the organization. E.g. as an email arrived from a Customer in respect of a Project the routine was that a copy of that email would be saved into a Public Folder for that Project, which might well be nested under the Public Folder for the Customer. Over the years thousands of Public Folders were created, containing large volumes of emails – in many organizations, terabytes of emails. Now the sun is setting on Exchange Public Folders! The latest versions of Exchange simply cannot accommodate the large Public Folder environments that built up on earlier versions of Exchange. Use Office 365 / SharePoint Online to replace Public Folders? It is more difficult to visualize the structure of the new SharePoint-based email store. Previously the users could see and understand the tree structure of the Public Folders. In a lot of implementations, the new SharePoint-based solution prompts the user to enter metadata as they save emails. This is a real added overhead, because users were never prompted for metadata as they saved to a Public Folder. The OOB integration of Outlook and SharePoint does not really allow a user to save an email to an area in SharePoint by simply dragging and dropping – which they were always able to do to save to Public Folders. In this blog post we will see how adding MacroView Message as a ‘front-end’ to an email store based on Office 365 / SharePoint Online enables solutions that are an effective replacement for Public Folders. The screen shot below shows how the MacroView software would display this structure in Outlook. The MacroView software automatically discovers all the areas in the Office 365 tenant for which the user has permission and displays them to the user as an accurate tree-view. This leads to the first advantage – the MacroView software makes it easy for the user to visualize the structure – the new SharePoint-based email store looks like a tree much the same as the tree of Public Folders. MacroView pane in Outlook shows the structure of an Office 365 tenant, including an Email Management site collection. Already-saved emails are displayed in the main central pane of Outlook. Note the formatted preview of a selected email. When the user clicks on an area in the Office 365 email store the MacroView software displays the emails that are stored in that area. The display shows the Subject, To, From and Received Time for each email, together with a paperclip icon to indicate whether it has attachments. If the user clicks on the Subject heading, the emails are grouped by Conversation Topic. In summary, a MacroView + SharePoint Online solution provides a viewing experience that is very similar to viewing emails stored in a Public Folder. The MacroView software allows the user to save an email by dragging and dropping to any document library, document set or folder that appears in their MacroView tree-view display. 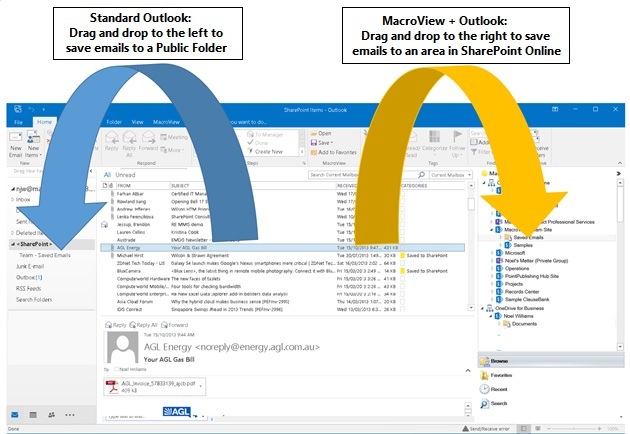 The MacroView user can select one or multiple emails in any Outlook folder (including Public Folders) and drag and drop to save them to SharePoint Online. The saving of multiple emails is performed in the background, so that you can go on working in Outlook while the save proceeds. 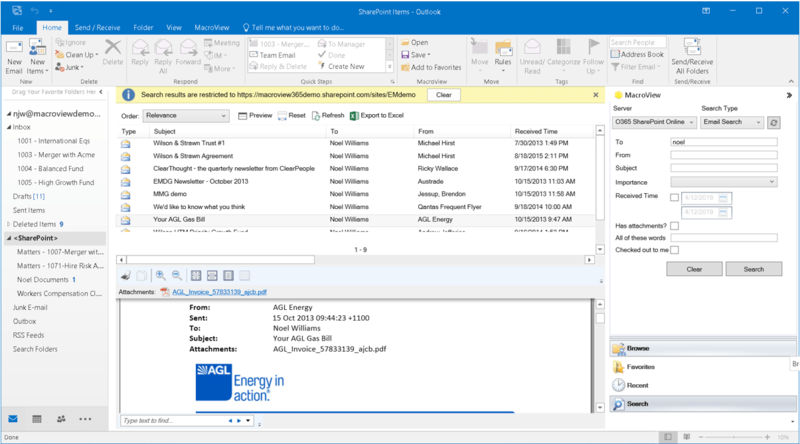 To save emails to an Outlook folder (e.g. a Public Folder) you drag and drop to an area on the left of the Mail window. To save emails to SharePoint with MacroView you drag and drop to an area on the right of the Mail window. From a user viewpoint that’s the only difference! Drag and drop to the left to save emails to a Public Folder; Drag and drop to the right to save to an area in Office 365 / SharePoint Online. 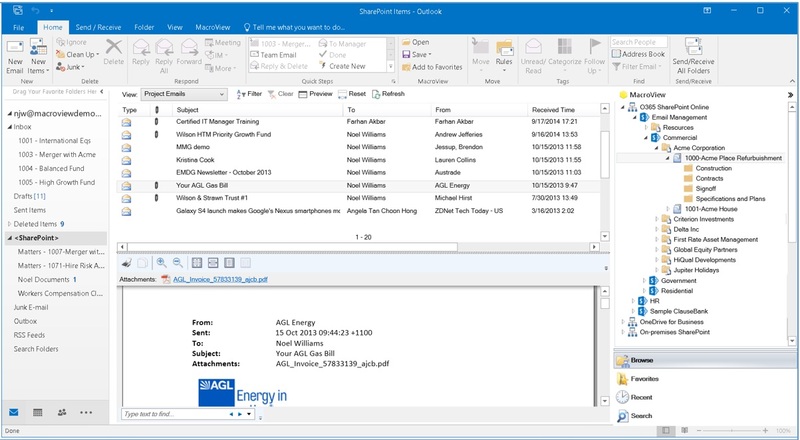 As it saves an email to Office 365 / SharePoint Online the MacroView software automatically records the attributes of the email (To, From, Subject, etc.) as metadata. The advantage of using a document set for each Project is that the document set is a great way to implement automatic metadata recording. E.g. as an email is saved, either to one of the Stage folders or to the Project area itself, metadata attributes such as Project Name, Project Code, Project Manager, Project Start Date, etc. can be recorded automatically for the email. By ‘automatically’ we mean without prompting the user for metadata. As the user drags and drops to one of the Stage folders – e.g. to Contracts – the MacroView software can automatically record the value of a Stage metadata column – again as part of avoiding the need to prompt the user for metadata as they save. In summary, a typical MacroView + SharePoint Online solution to replace Public Folders does not prompt the user for metadata as they save emails – i.e. the same experience as when saving to a Public Folder. The way the MacroView software automatically records the attributes of emails and other metadata as emails are saved to SharePoint Online enables a significant advantage compared to a Public Folder solution. This advantage is that the user can search efficiently for emails across the whole SharePoint email store. In our worked example, emails can be found based on a combination of content contained in their email body or one of their attachments, and / or metadata such as Project Type, Project Start Date and Project Manager as well as on email attributes such as To, From, Subject, Received Time, etc. The availability of metadata makes the searching much more efficient than using only content in the search criteria. Such searches are not possible against a Public Folder-based email store. MacroView pane in Outlook lets the user search across the Office 365 email store for emails based on their content and metadata. Note the formatted preview of a selected search result. As it saves an email to SharePoint Online, the MacroView software automatically names the MSG file that it creates. This automatic file name prevents duplicate copies of any email in any area of the SharePoint email store – no matter how many recipients attempt to save that email to that area. A Public Folder store does not prevent duplicate copies of an email. MacroView makes it easy and intuitive to save emails from any Outlook folder to areas in SharePoint Online – it makes it just as easy to save attachments or files from a Windows folder. This brings us to another advantage of a MacroView + SharePoint Online replacement for Public Folders – easy to have all the documents and emails related to a Client / Project / Transaction in the one place. As you drag and drop to save an email the MacroView software can automatically split off the attachments in the email and save them separately to the same area as the email. Depending on your chosen configuration, the resulting MSG file can contain the email and its attachments, or just the the body of the email. See this MacroView blog post. A user working in Outlook can use the Search Site Tree command of MacroView to rapidly find the SharePoint Online area that they want to work with and be automatically navigated to that area. The user experience is much better than navigating to a specific Public Folder in a large tree of Public Folders. A further advantage of a MacroView + SharePoint Online solution as a replacement for Public Folders is that the emails can be saved automatically. The MacroView Corporate Email Filing module can insert a special filing tag into the Subject of an email so that the email is saved to a specific SharePoint Online area. All subsequent emails in the same conversation will have the filing tag in their Subjects, which will mean that all these emails are automatically saved to the same SharePoint Online area as they are received and sent. The Labels and Label Policy mechanisms of Office 365 enable another distinct advantage of a MacroView + SharePoint Online solution compared to the Public Folders that it is replacing. All files arriving in a folder can be automatically labelled so that they are protected as Records for a specified time period. E.g. emails and attachments saved to a Contracts folder can be protected from alteration or deletion for 7 years from the date they were saved. See this MacroView blog post. The MacroView software provides and easy-to-implement and easy-to-use way of integrating a CRM, Practice Management or other Line of Business system to a SharePoint Online email and document store. By simply clicking on a Documents and Emails hyperlink in the record for a Customer or Project the user is switched into MacroView DMF Explorer and automatically navigated to the area where the documents and emails for the Customer or Project are stored. You can then click to view and open those documents and emails, and drag and drop to save additional emails and attachments from Outlook or files from any Outlook folder. Migration of emails from a large Public Folder structure into a replacement Office 365 / SharePoint Online structure is not a small task. The MacroView Standardiser utility can assist by processing emails that an IT area has moved into SharePoint Online in bulk by using Windows Explorer. As its name of the utility suggests, the result is email files that have a standard format, naming and metadata treatment. All the migrated emails are MSG files, these files are named to prevent duplicates and the attributes of the email are recorded as metadata – all exactly as if the emails had been saved by drag and drop or automatic filing by MacroView. Sometimes the best way to approach migration from existing Public Folders is not to do a full migration at all. Business users can use the bulk email filing capability of the MacroView software to move the emails (and other files) for active, current Customers and Projects to the relevant new area in SharePoint Online. The business user selects multiple emails in an existing Public folder and then drags and drops them to the corresponding new area in SharePoint Online. The moved emails are automatically deleted from the Public Folder. In conjunction with this ‘grass roots’ migration approach, the SharePoint Search engine can be used to index emails in their existing Public Folders. While working in Outlook a MacroView user can then perform a unified search – so that some results are from the new SharePoint Online areas while others are from the legacy Public Folders. This approach is relevant for finding emails for inactive or closed Clients and Projects. It dramatically reduces the urgency of migrating all Public Folder content to SharePoint Online. For more information about solutions for generating and managing documents and emails using Office, SharePoint and Office 365 contact MacroView Services.